We hope all of you will be able to attend our "Spring Has Sprung" family picnic at the Encino Park on the corner of Balboa and Ventura. Pack a lunch sack for the family and we'll provide light refreshments and drinks. We've planed our annual Spring has Sprung picnic! We hold family events at Harmon Oaks with one real goal in mind: we'd like our parents to meet the family's with whom their children spend more than eights hours of their day . Aside from merely spending time together, our children have formed very close bonds and truly beautiful friendships. Parents will have the opportunity to get to know each other (or re-kindle a family-friendship during a time where we can do more than exchange a few quick words in the lot and at pickup). We ask that parents have their little ones where our school tees during school events. So please be sure to have our tee ready to wear in the morning! If you do not already have a school tee, purchase our nursery school t-shirt for your little one for this and future school event attendance. Tees are $15 dollars. 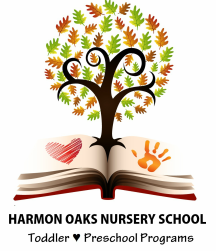 We tried to display Harmon Oak's personality and philosophy in the design of the t-shirts, and last year, with the assistance of Atmosphere Creative founded by two of our very own parents, we designed tees we find to be quite fitting for our children and nursery school. There are two colors to choose from- last year's design in Agua-Turquoise and this year's design in Vintage Green. If you don't have a tee, simply email us and let us know what size and color you need. Enjoy the colors of spring & please RSVP to the right! ~ Ms. Mariya, Mr. Harry, Ms. Lourdes & Ms.